Good morning. It is an honour to be here with you during London International Shipping Week 2017. 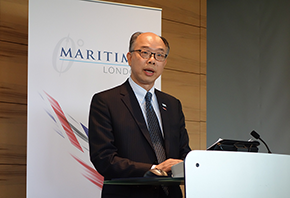 Let me first pay tribute to Maritime London for arranging the seminar, providing us with an excellent forum to share thoughts on how to foster further collaboration to capitalise on the potential and opportunities arising from China's Belt and Road Initiative. Globalisation is nothing new, and "going global" is very much a historical as well as on-going aspiration espoused by many nations and cultures. Some 2000 years ago, the Chinese Han Dynasty pioneered the ancient Silk Road for trade, linking up China, Central Asia and areas surrounding the Mediterranean Sea. In 1492, famous explorer Christopher Columbus made voyages across the Atlantic Ocean and ultimately discovered the Americas. Also during the 1400s, the Maritime Silk Road was shaped by Admiral Zheng He from the Chinese Ming Dynasty, who led seven expeditions across the ocean from China all the way to southeast Asia, India and Africa. Today, in the 21st century, the Belt and Road Initiative opens up a new horizon, connecting each and every economy and their people all the way from the East through the Middle East to the West. Unveiled in 2013, the Belt and Road Initiative comprises the land-based Silk Road Economic Belt and the ocean-going 21st Century Maritime Silk Road. It is a collaborative and inclusive strategy aimed at promoting infrastructure development, connectivity and policy co-ordination, thereby boosting trade and investment, and deepening friendships and cultural exchanges among countries along the Belt and Road corridors. Spanning across 9 000 kilometres, the Initiative covers more than 60 countries in Asia, Africa and Europe and embraces over 60 per cent of the world's population. Altogether, these countries represent around 31 per cent of the world's GDP and over one-third of global merchandise trade. Needless to say, trade links, capital flows, and infrastructure investment will be strengthened among economies along the Belt and Road corridors. By 2050, the Initiative is estimated to contribute up to 80 per cent of the world's GDP growth, and would enable three billion people to migrate from low-income households into the middle class. Ladies and gentlemen, along the Belt and Road corridors, massive opportunities and demands for quality maritime and shipping services are emerging. If you aspire to extend your business operations along the Maritime Silk Road, Hong Kong is always there for you, be it your starting point, your springboard, or most importantly, your trusted partner. Our strengths, in particular, lie with our strategic location, our unique role as a Special Administrative Region of China, and our wide portfolio of high value-added maritime services. Located at the heart of Asia, Hong Kong is strategically positioned. Being the world's largest RMB liquidity pool outside the Mainland of China, being the busiest airport for international air cargo and being the world's fifth busiest container port, we are well equipped as a financial, aviation and maritime hub to connect you to the Mainland of China and vice versa. In the maritime sector alone, Hong Kong maintains sea-cargo operations with 45 countries along the Belt and Road corridors. With frequent scheduled liner services connecting to some 470 destinations, Hong Kong port is a major transshipment hub. To this end, we stand to serve as a "super-connector" facilitating trade and capital flows amongst China and the rest of the world, especially economies covered by the Belt and Road Initiative, as your trusted partner. Location aside, I must mention here the unique role of Hong Kong under "one country, two systems". We are uniquely distinct from other cities of China. We enjoy a high degree of autonomy with rights and freedoms enshrined in Hong Kong's constitution, namely the Basic Law. No wonder the Heritage Foundation has ranked Hong Kong the world's freest economy for 23 years consecutively. All along, we have offered a business-friendly environment with a low, simple and predictable tax regime. 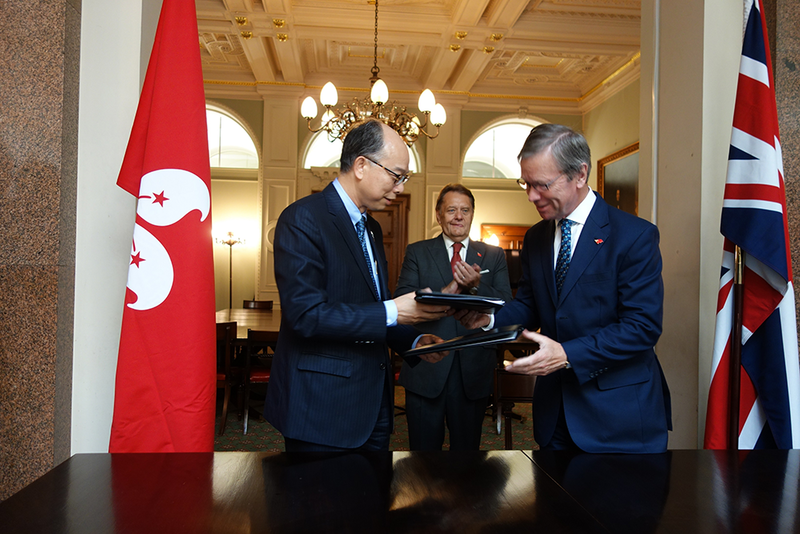 Without doubt, doing business in Hong Kong is easy, due largely to the international practices we embrace, the open and transparent regulatory regimes, and our determination to operate a level playing field for all. Moreover, Hong Kong has thrived with a longstanding shipping and maritime tradition since the 19th century. We are widely recognised as an international maritime centre and regional logistics hub. With a diverse base of experienced professionals providing upstream and downstream services, we offer a total solution to facilitate international trade. Focusing on the maritime sector, there are over 800 maritime companies providing a myriad of maritime services in our city, ranging from ship management, ship finance and marine insurance to maritime legal and arbitration services. There are also unique advantages to do shipping business in Hong Kong. For instance, we exempt profits tax for international shipping, including the international carriage of goods and charter hire income from ocean-going vessels. In addition, under the Closer Economic Partnership Arrangement between China and Hong Kong, Hong Kong maritime services providers enjoy national treatment when they access the Mainland market. British maritime services providers may make use of these preferential arrangements to access the Chinese market. When President Xi Jinping visited the UK in October 2015, he reckoned that China and Britain would build a global comprehensive strategic partnership in the 21st century, and jointly open up a "golden era" of an enduring, inclusive and mutually beneficial Sino-British relationship. We are aware that more British businesses are expanding their presence in Asia, particularly in China. For instance, the UK was the first major Western country to announce its intentions to join the Asian Infrastructure and Investment Bank, a multilateral financial institution supporting the Belt and Road Initiative. As many of you would probably agree, London and Hong Kong share a number of common attributes. Both are cities of high connectivity with an open and free economy, and hubs with a long maritime history. The more closely the two hubs co-operate, the more we can co-create and co-benefit from the opportunities arising from the Belt and Road Initiative, and help translate the vision of the Initiative into action. 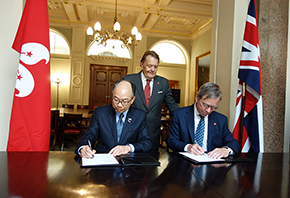 Just yesterday, on behalf of the Hong Kong Maritime and Port Board, I signed a Memorandum of Understanding (MoU) with Maritime London. 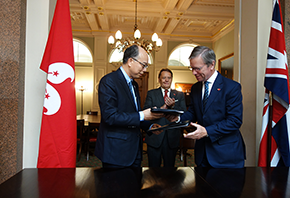 The MoU marks an important milestone in the partnership between Hong Kong and London, and I can see many collaboration opportunities right round the corner. Through the gathering of distinguished specialists, professionals and industry leaders such as your good selves, I am looking forward to the forging of closer and lasting ties between us all. 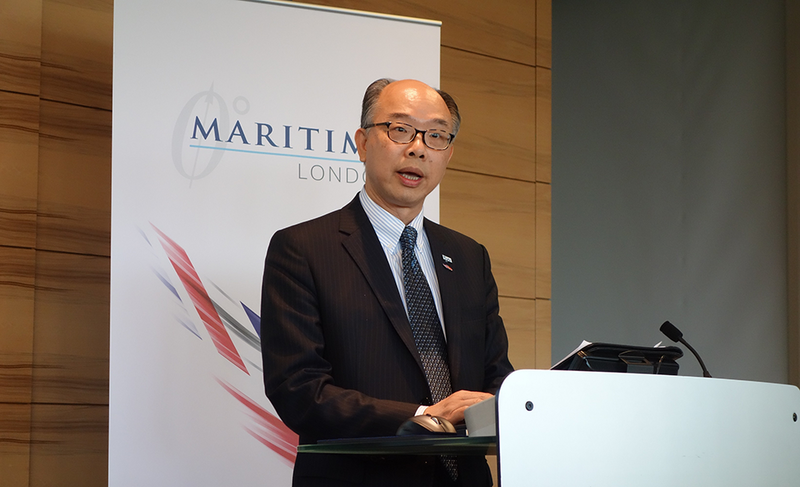 In closing, may I wish you all an enlightening and fruitful seminar, and the London International Shipping Week every success. Thank you.